Most of the individuals who put on a Maple Leaf uniform develop some kind of following and are, well, pretty popular. Few reach the heights of, say, a Johnny Bower, George Armstrong or in the modern era, someone like Wendel Clark or Doug Gilmour, but you know what I’m saying. (I would include Mats Sundin but he seemed to have a lot of detractors, despite his stellar play over many years in a Leaf uniform.) The Leafs are an exceptionally closely followed sports franchise with a wonderful history, a rich legacy and a remarkably passionate following—albeit one with not enough championships in recent decades. If a guy plays his guts out (in my childhood that would have been a Gerry James in the late 1950s and in a later era, big hearted players like Brian Spencer and Scott Garland in the 1970s), we remember them forever. The same would apply more recently when it comes to a player like Mike Brown, who clearly gave everything he had in a modest role in Toronto. Bottom line: if you play for the Leafs, and you play hard, we like you. If you are really talented and also work hard (like a Darryl Sittler, right), we typically will want to build a statue in your honour, since we never seem to be able to actually host that much-discussed parade. Today, with the blue and white now an extreme longshot to enter the playoff sweepstakes, I’m checking in on some recent former Leafs to see how they seem to be doing in their current environs. I can’t shed any real insight, just some surface stats, but a quick tour around the NHL tells us there are still a lot of ex-Leafs plying their trade out there. Francois Beauchemin was OK in his short time here, but he never seemed to find his comfort zone. We can try to assess the reasons why (having a much bigger role than he had while helping the Ducks win a Cup in Anaheim; maybe it was the coach…) but whatever, he was not the confident defenseman we expected most nights. No one is asking to un-do the trade that brought Lupul and Gardiner here, but we should report that he is a go-to guy for Duck coach Bruce Boudreau—a plus 22 this season on a very good team, playing more than 23 minutes a night. Luke Schenn was, sadly, a whipping boy for fans here. Hee was traded after four seasons when he was still only 22 years of age. Schenn had by all accounts a very strong first season in Philly a year ago, but struggled to start the current season. His minutes are way down from a year ago (less than 17 minutes a night) but he has bounced back from an awful plus/minus rating a couple of months back to be a plus 2 on the year at this point. He is playing mostly as a 5/6 defenseman for the Flyers. Clarke MacArthur was an up and down Leaf. Some fans really liked him (still do) others not so much. He’s had a hot and cold career, it seems, but this year in Ottawa he has thrived, putting up 55 points. He is a plus 12. I was never a big MacArthur guy but he has certainly done well with the Sens. After signing in Washington, Mikhail Grabovski started hot, cooled off, got hot again but then was injured for a few weeks. He is just back and playing again. The talented Caps have been something of an enigma—they will be life and death to make the playoffs. Grabbo, I’m told, has been good when healthy, earning 34 points in 54 games (playing about 16 minutes a night) and putting up a plus 5 rating as the regular season winds down. Some Leaf fans wish he was still here. I don’t see his absence as that impactful, as much as I grew to like him during his Leaf tenure. Jonas Gustavsson was, like Schenn, absolutely hammered by a part of the Leaf fan base. I always thought it was largely unfair. He was not healthy, often injured, but he seemed to give his all in Toronto. With the Red Wings, he has (predictably) been injured a lot (the everlasting groin issues…) but I’ve tracked his season quite closely and he has won some big games against very good teams, though he lost in Montreal Saturday night. Earlier in the week, however, he had a solid game against the Lightning. His stats are modest (2.63 GAA and a .909 save percentage) but his record in 25 games is 16-5-3. We can’t say this is the elite, healthy, Lidstrom-led Red Wing team of the past twenty years. So overall he’s been pretty good as a backup, it would appear, outside of the Toronto spotlight. 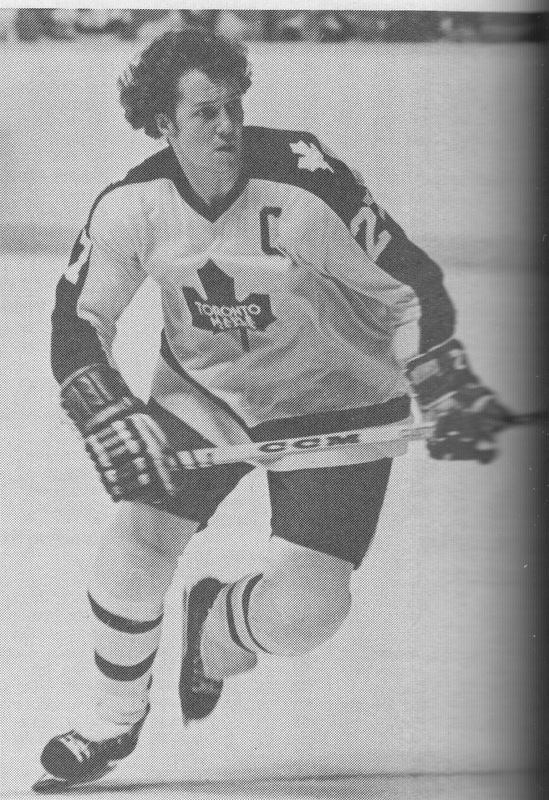 The aforementioned Mike Brown was a popular Leaf in his time in blue and white. He has bounced around a lot as a rugged, willing-to-stand-up-for-his-teammates fourth liner. He is a minus 9 on the year, playing 7 minutes a night (in 47 games this season) on a strong San Jose squad. The often-traded Kris Versteeg is back with the Blackhawks where he won a Cup a few years ago. The veteran winger has earned 29 points and is a plus 8 in 60 games. Keith Aulie (traded for Ashton) has not played much with the Lightning this season. He's a minus 3 in 15 games playing about 10 minutes a night. Alex Steen, of course, goes back two regimes, to that interim period between Ferguson Jr. and Burke. Cliff Fletcher dealt he and Carlo Colaiacovo to St. Louis for Lee Stempniak. Steen has faced a few injury (some concussion-related) issues, including this season, but he has become a wonderful all-around NHLer, a perfect Hitchcock forward. He has 60 points and is a plus 20 playing 20 minutes a night. For his part, Colaiacovo is back in St. Louis after a stint in Detroit. He’s playing about 14 minutes a night and has a zero plus/minus rating. We’ve had this Phil Kessel-related discussion before and many Leaf fans get agitated at the mere mention of the names in question, because those fans rightly point out that Kessel was traded for draft picks, not actual players. No Leaf fans are asking for a recount on that trade, I don't sense. But it is only fair to acknowledge that while the Leafs have done great by Kessel, history will show they did give up two quality selections in the drafts that saw the Bruins grab Tyler Seguin second overall and Dougie Hamilton 9th the following June. We know that Seguin is now in Dallas and has been pretty darn good. Those who said he was a very high “plus” player with the Bruins because he played with such a strong all-around team may have been right, but he is still a plus 18 to go along with an impressive 80 points registered this season. Throw in the fact that Hamilton is a 20-year old playing 19 minutes a night and is a plus 23 with 25 points and the trade will no doubt provide water cooler fodder for years to come. My point in raising the fortunes of these players is not to dissect old trades, simply to provide some context. A trade like the one that brought Phaneuf to Toronto clearly has been a “win” for the Leafs. While I always liked Ian White, it was a deal that sent a lot of extra pieces the other way for one very solid defender who is still a Leaf, and a captain at that. Still, most trades are not about clear-cut winners and losers. Assessing relative impact is much more nuanced than that. And in reviewing the (albeit surface) data today, it seems clear that while the Leaf organization and their fans would make most of these deals again, the ex-Leafs have, for the most part, found a welcoming home where, if they are not necessarily thriving, they are at least certainly contributing to some very good teams. Thank you for the updates on some ex-Leafs. Every case is different of course, but for the most part I want to wish players well as they move on. Seeing as I first became a Leafs fan in the late 70s, I received an early education in the horrors of the business side of things as Harold Ballard destroyed a promising team. It made me sick to watch Palmateer in net for Washington playing against the Leafs, to see Lanny McDonald, Tiger Williams, et al, playing elsewhere, and even their replacements, such as Wilf Paiement and Robert Picard, quickly moved out for lesser and lesser value. I never blamed the players themselves as it all seemed far beyond their control. In more recent years we've seen other players that might have been special but they got away before the impatient Leafs knew what they had, Steve Sullivan and Tuuka Rask immediately come to mind here. By and large it appears that after the early 80s death spiral, the Leafs gained as much as they lost in the end. The business side is different now of course, free agency and high contract demands play a factor like never before (as does the sense of self-importance in some players that come with rich contracts). Either way, bittersweet as it may be to watch some of the guys as you listed above prove the Leafs wrong, I say cheers to them and best of luck moving forward. I certainly could have (should have) included Rask in this update, Pete. He's on that "got away", for sure. Totally agree on the Ballard/Imlach destruction of the roster in the early '80s. Amazing how quickly that all unravelled. Like you, I wish ex-Leafs (past and present) who I liked well- and enjoy writing about them. Thanks Pete. Tuukka Rask - Need I say more.